It was Christmas Eve, and I didn't want to go! *****There has been an update to this post, please read below! It was Christmas Eve and I really did not feel like going out to the abortion mill. I had so much to do, family to visit, last minute gifts to pick up; this really did not fit in. 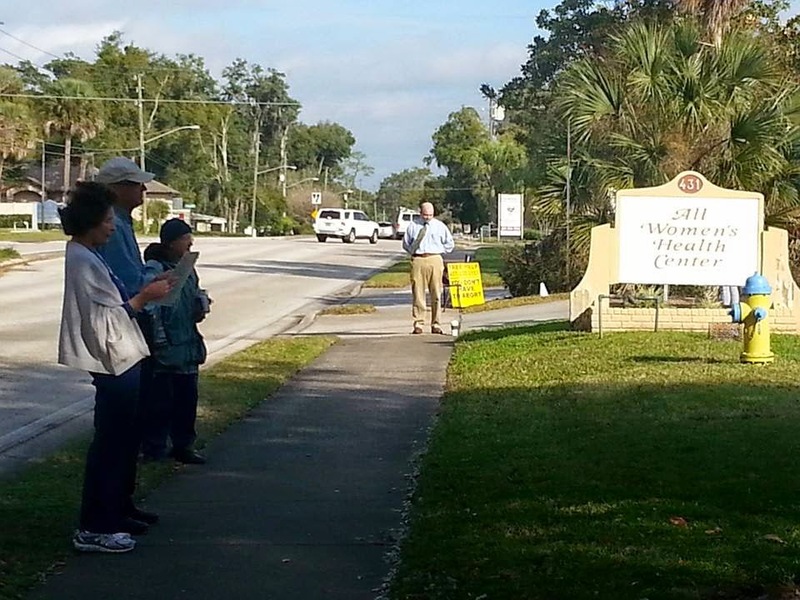 But, here it was, Christmas Eve morning and I was heading down to the awhc abortuary, the only mill open out of the five here in Orlando. As I headed down the highway, I had a sense of joy overwhelm me suddenly, and I knew that I was on my way to where I was supposed to be going. When I arrived, two sidewalk counselors were there, along with two from the prayer support group that come every Wednesday. Not too long after, another sidewalk counselor arrived. The abortion bound women started coming in as each of us took our spots offering help and another way, pleading with them to make this the Christmas of Life and not death. To let their little child continue to grow and experience opening Christmas presents and having a seat at the Christmas table. We shared with them, that if they went through with having this abortion, every Christmas that rolled around would be a reminder of the day their child was killed. They would remember this dark, dank place and everyone sitting in the waiting room; a memory that would not bring good thoughts to mind. We were able to speak with one young woman who had accompanied her abortion bound friend and encouraged her to go inside and inform her of all the help available, that abortion never will be the answer. She did try, but unfortunately, her friend's boyfriend's pressuring for abortion won; this little child lost his or her life on Christmas Eve. We continued to reach out, pray, read scripture and sing Christmas Carols into the waiting room window. And then it happened, a truck began to leave the mill, but first stopped at the driveway to let us know she had changed her mind, she was keeping her baby! Tears were pouring down her face, thanking us for being there for her. These were tears of joy, even in the midst of not knowing how things would turn out. All she kept saying was thank you! We hugged her and talked with her exchanging phone numbers; she then left with one of the sidewalk counselors who took her to lunch. Yes, for something that I really didn't want to do, proved to bring joy unspeakable, with a very thankful young lady who came close to making a decision that would have left her a broken woman with a broken baby. And, a little child continues to grow inside his or her mommy's womb, safe from the abortionist's knife!. I will always remember the Christmas Eve of 2014; the warriors I had the privilege of standing on the sidewalk with--together speaking up for those who have no voice and trying to rescue those unjustly sentenced to death. And, I will always thank God for filling me with joy as I headed to that place of death and allowing me to witness HIS tremendous love, grace, mercy and power in rescuing this precious child! This was the best Christmas present ever! *****UPDATE--As I was getting ready to walk out the door to go to a wedding on 12/30, I received a phone call on the ministry line, and I am so glad I was able to pick up this call! "Is there anyone I can speak with?" Were the words that came from the young lady on the other line. I immediately told her yes, and that I would love to speak with her. She went on to tell me that she had gone to an abortion clinic on Christmas Eve with a friend who had gone with her, who, she said, really didn't want her to get the abortion and had been trying to talk her out of it the whole way there. When they arrived, according to this young woman, there were people out front trying to talk with them. They went inside, but she told me her friend went outside to talk with the "people." I then asked her what abortion center she had gone to and she said, "The All Women's Health Center!" I said, "I was there on Christmas Eve and I remember talking with your friend!" 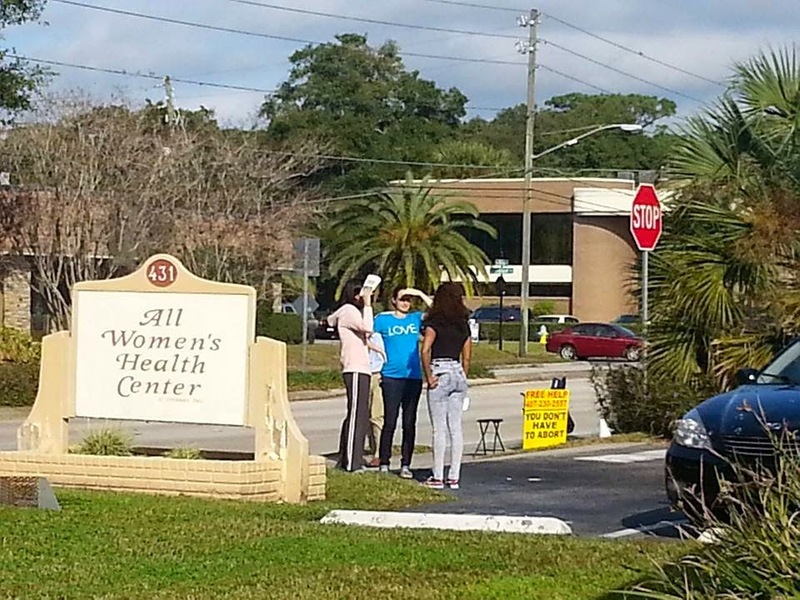 She then said that her friend had gone back inside and given her the information the "people" out front had given her, and again tried to talk her out of the abortion, telling her that the folks out front had said there was help available. Then her boyfriend arrived and started pressuring her and she told me she became confused, thinking about what her friend had said and the help that was offered. She decided to leave, and did not have the abortion! Here, we thought she had the abortion with her baby dying on Christmas Eve, and instead, she had left that place of death with her child still growing in her womb! But during the weekend, she kept thinking and thinking and found herself at the awhc abortuary again, on Monday! When she walked inside, there was no one at the receptionist's desk and she thought, "maybe this is another sign not to do it!" But then the receptionist came to the front and after talking with her, she made an appointment for Wednesday, which would be New Years Eve! She told me that when she walked out, she didn't feel good about scheduling another appointment at all, but didn't know what to do. Then, as she was getting in her vehicle, she saw the brochure that we had given her friend on Christmas Eve, who had given it to her. She picked the brochure up and really looked at it and began to read it and then put it in her purse. Fast forward to Tuesday, December 30th, she took the brochure out of her purse and decided to call the number, which she did, and was talking with me! As she shared what had happened, I said to her, "Honey, I believe that God has been trying to get your attention and show you that abortion is not what He wants you to do!" Right away she said, "I know!" I began to share with her the real help available and then asked how old her baby was, to which she replied, "Four months." I then let her know that everything was there, his/her fingernails, hair, eye color; everything! I then shared my own experience with abortion and other women; how abortion never is the answer and that this decision is one that you can not take back. I then asked if her boyfriend was still pressuring her and she said yes. I told her that no one can make you have an abortion, and the percentage of relationships split up after an abortion. She then said, "Yes, I've been thinking about that, and I should never do something like this that I don't want to do for someone else!" I said, "that is right, you have to do what you know is the right thing to do!" I then asked her, "Are you going to keep that appointment tomorrow?" And right away she replied, "No, I am not going back there, I am going to keep my baby!" She thanked me and the others for being there that day, and how thankful she was for her friend that cared so much. We made plans to go to lunch and I hung up the phone. When I put that phone down, I was again in awe of God's wondrous and glorious power! We thought that baby had died, and God has had this baby in the palm of HIS hands! To HIM be the Glory! How amazing is the goodness of the Lord God Almighty? So good, so very good! Two babies were saved on Christmas Eve.....one that I shall never forget!